Registration until all 60 seats have been taken or until 31.3. 18:00 UTC. Game start, the third game of the series starts on first of April at 18:00 UTC. Please respect our rules, a violation or circumvention of the rules is like destroying the balance with Gold. 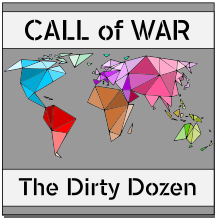 The games of the Dirty Dozen should be played as sitting on the other side of your friends with you want to have fun and a good and fair fight! If you like to play with us in the next round you need to choose one of the 15 Squads where one or more places left free. You can say to your friends/comrades that you are in this Squad. Players in one Squad will play together in the same team in the next round. Three Squads will build a Team for the next game, The Teams will be mixed randomly with each 3 Squads. The conversation with the game-ID and the password will be set up on 03/30/2019. I will only add new players to this conversation after checking his profile. To guarantee that we have not more than 4 players in the game from the same CoW-Alliance. Registration is open until the first of April is over - please leave a reply after vote for a Squad! The post was edited 11 times, last by Xarus ( Mar 31st 2019, 9:41am ). This position is impossible to play! Because there's no telling who's gonna be on your team. Play when all your actions can be transferred to the enemy can not play. @KOLIN17: Sorry, but I don't get what you want? You can choose a Squat you like to play - if you later see that your friends in a other Squad you can change you Squad. Could not find Diddly Squat on the list? Although my forum name is Spaghettini, I changed my game name to Dasajocu. Will that be a problem for playing the Dirty Dozen? No, but it's good to know if the nickname in forum different to the one in game. In Kilo are 5 Players???? With a few days left to go, way too few applications. Should we revert back to two teams only? If we get not enough players we will take the North-America-Map and multiply the VP with two at the end. Number of players should be between 6-10 players per team. 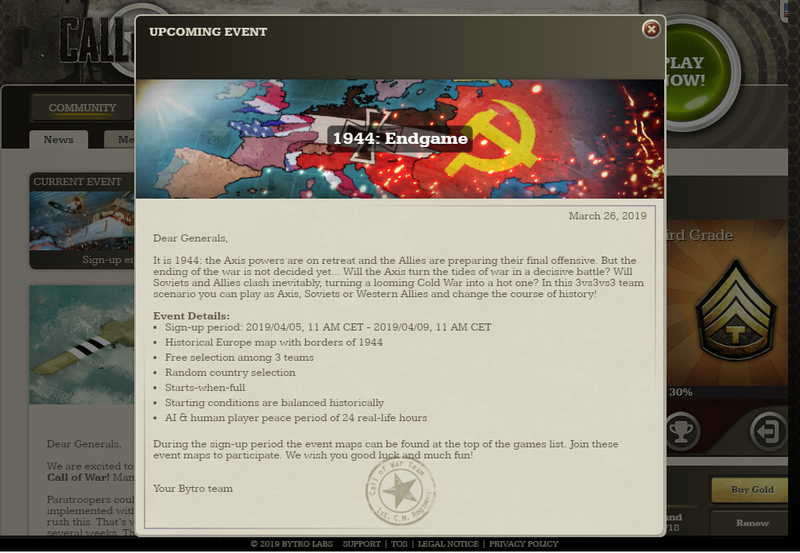 I propose to play a round without gold on a new historical map - 1944: Endgame. The post was edited 1 time, last by war-play ( Mar 30th 2019, 5:57pm ). Only 2 team with 12 players and American Civil War will be began! Hey guys, so if I vote a team, I will be automatically joining the game into that squad ? I cant find the ID of the game and the Passwort. I got each moth the same problem, and I am sorry for writing this message but I tried all I could do. I looked in forum and in conversations but I did not see the game ID and the passwort for the game. In march in the news stand, that the game is open, but I dont come in, because no id an passowrt. Game isn't open yet, will be in 8-10 hours.